So…sometimes, it’s the simple things that make for the yummiest of lunches. I was sick for the entire first week of the school holidays, I taught one food class, then bam! So when I needed to bake in the second week, I was looking for cheating methods. That’s how these easiest ever ham and cheese scrolls came about…desperation. 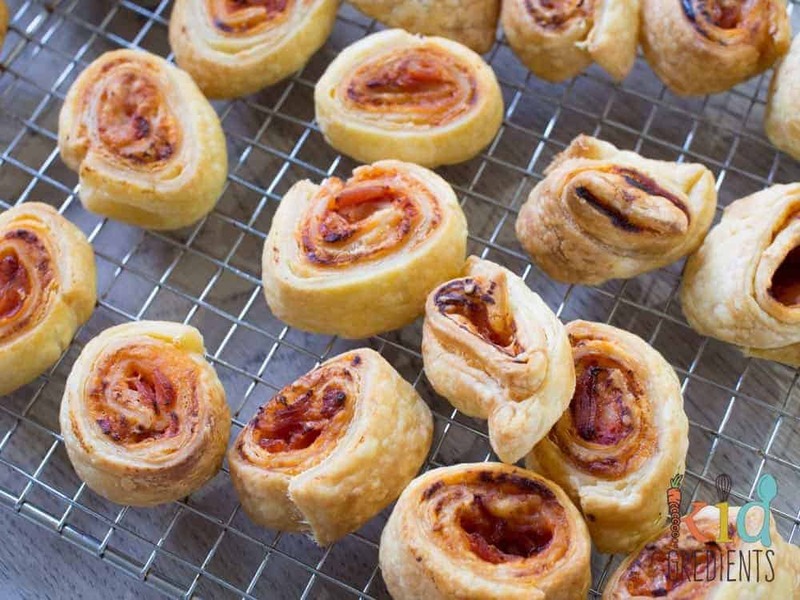 These scrolls will be your lifesaver when: you realise in the morning you need something for lunches, or when you don’t have any yoghurt for yoghurt dough scrolls. Using all butter puff pastry, it’s cheating in an yummy way. These are so simple they hardly warrant being called a recipe, and the cheese can be subbed for any cheese you have in the fridge. The ham? Well, it could be bacon, chicken, zucchini, whatever you want. I use tomato paste and a sprinkling of herbs because I never buy pizza sauce but you could easily use that instead. I’ve been making these for years, my mother made them before me and called them pinwheels, I’m calling them scrolls, because that’s what my kids know them as. They were almost all devoured on the day of making and the rest have been frozen for school this week…because…lunchboxes don’t make themselves! Spread the puff pastry with the tomato paste, then the herbs. Cover with the ham and cheese and roll up like scrolls. Cut into 2 cm wide rounds. Space out on a baking tray lined with baking paper or a silicone liner. 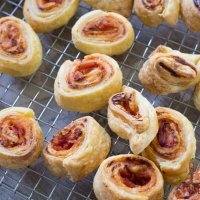 If adding bacon to the pizza scrolls do you cook the bacon first? No, I don’t, 15 minutes is long enough to cook the bacon through. Hi just wandering is butter puff pastry the same as the frozen puff pastry brought from the supermarket? I dont think i have ever seen butter puff pastry but to be totally honest ive never looked haha. So i have no idea! There is all butter in the supermarket and there is also the canola style. I like the butter puff as it has a nicer texture. Ham and cheese pizza scrolls…. Fantastic, great for lunch boxes, even my teenage son thought they were good and decided to make some himself!! We also like them with vegemite and cheese filling- yum! Scrolls are the perfect lunchbox additions, aren’t they?